Spotlight doesn’t come with a HTML importer. I was wondering why I couldn’t search through the release notes. Someone want to write one? ICeCoffEE work would have been started by now, except my access point, now almost three years old, seems to have become unusable today. The access point part of it is giving abysmal performance (1 KB/sec) and the Ethernet switch part just stopped working; when I plug things into two ports, one of them goes through a continual cycle of being connected for a second, then disconnected for another second. I’ll borrow an access point and get working tomorrow, I guess. An AirPort Express will likely replace it, since I’d love to dump my current three-step “getting music to the stereo” solution. Though that means I’ll need to get a router box and Ethernet switch when Steve leaves in about a month. Unfortunately it’s been two incompatibilities in two weeks for ICeCoffEE—discontiguous selection (command-drag) in NSTextView, which is new in Tiger, is broken with ICeCoffEE installed. I’ll get to work on it this weekend. Otherwise, Tiger is great except for the impossibly broken Find/Spotlight UI. One thing John Siracusa didn’t mention was Apple’s inexplicable replacement of a great, resizable path widget with one that is no longer resizable, and expands when you mouse over a given folder. Of course, the new version doesn’t let you easily see deeply nested paths to multiple folders by just using the arrow keys on find results, which I’ve done since Find File in System 7.5. 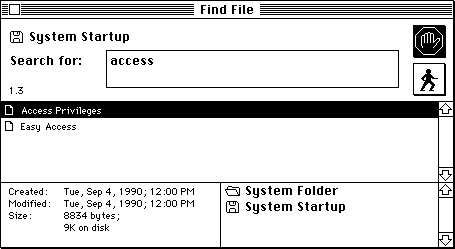 Maybe it’s the new retro thing: you couldn’t resize the Find File DA window in System 6, either. Also note the great display of file information in System 6. Instead, to see more information in Spotlight, you have to click the almost-invisible little “i” widgets…once for each search result. 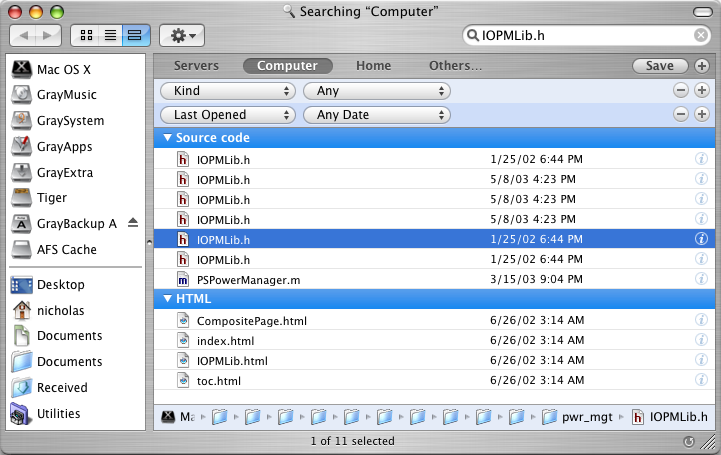 Or option-click the “i” and watch as one category of search results expands to fill several screens in space-wasting manner, or use the Inspector window if you’re lucky enough to be using the Finder’s variant of Spotlight. Progress! On the positive side, Tiger makes my over-four-year-old dual G4/533 so much faster that I almost thought about not buying a new Mac this year. (Almost.) It boots in about 20 seconds, which is pretty amazing. Good news: The Missing Sync for hiptop finally shipped today, after a development cycle too long to imagine. (Don’t blame Mark/Space; they’ve been nothing but amazingly responsive throughout the testing period.) It’s not perfect, but it works admirably well given T-Mobile’s idiotic sync limitations. And of course, not having to connect your Mac to a device to sync it is a great benefit. Bad news: the sync interfaces changed significantly in Tiger, making third-party sync integration a lot easier, but the existing conduits don’t work. Mark/Space promises a free update by the end of June, which means I’m not going to upgrade my PowerBook to Tiger until then. 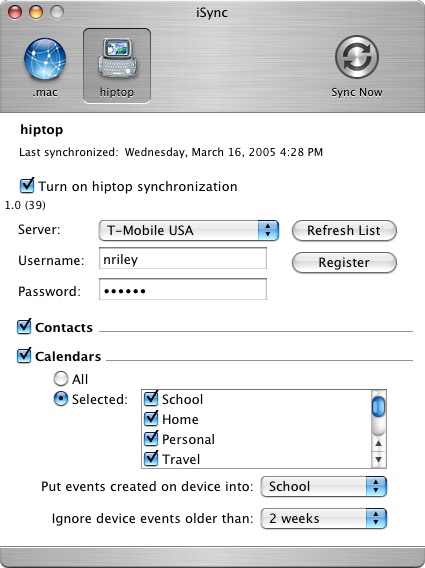 Of course, if the sync software had shipped back when originally intended, it wouldn’t have been so close to Tiger’s release. So, finally, I can show you this screenshot. And now, the reason it took me until ten minutes ago to release ICeCoffEE 1.4.1: Xcode. The installer building process that worked so nicely and seamlessly in Project Builder 2.x just completely failed once I upgraded to native targets. Xcode simply didn’t want to support taking an application skeleton (Unsanity Installer) and adding files to it. If I used an application target, Xcode complained the target couldn’t depend on itself, and if I tried copying the Contents folder rather than the entire installer bundle, the Contents/MacOS folder would mysteriously disappear. If I used an aggregate target, Xcode complained the target couldn’t depend on the other products that I inserted into the target (!? ); it refused to recognize any structure for the aggregate, so I had to hard-code paths all over the place, replace copy files operations with fragile shell script steps, and so forth. Finally, despite my specifying it every way from Sunday, Xcode didn’t think the aggregate target actually produced anything, so when I went to install it with xcodebuild install DSTROOT=foo the folder foo never got created and nothing was copied into it, so I had to rewrite the packaging script to manually compensate. and I’ve spent six hours today trying to release ICeCoffEE. Note that today is a Monday: that’s time I should have been spending on my research. I really hope Xcode 2.0 is less buggy than 1.5. Eleven days left. Unrelated but generally stress-inducing: My PowerBook came back today after 30 days at the Computer Loft—with a fixed display, but two screws missing from the bottom and a keyboard that doesn’t fit unless forced. What a perfect Monday.